Despite the best efforts of those who are involved, the financial sector continues to have a negative reputation for unethical and sleazy behavior. But why is the industry viewed negatively? Well, most people aren’t as knowledgeable about finance as they are other topics. In addition, the financial industry has been negatively viewed over a long period of time due to consistent actions associated with trading, borrowing, and lending. Of course, the economic crash didn’t help industry’s case. Today, finances are still a very personal subject. Trust is one of the biggest problems the financial industry faces and the industry climate is too unpredictable for people to let a financial advisor take the steering wheel and be in control. 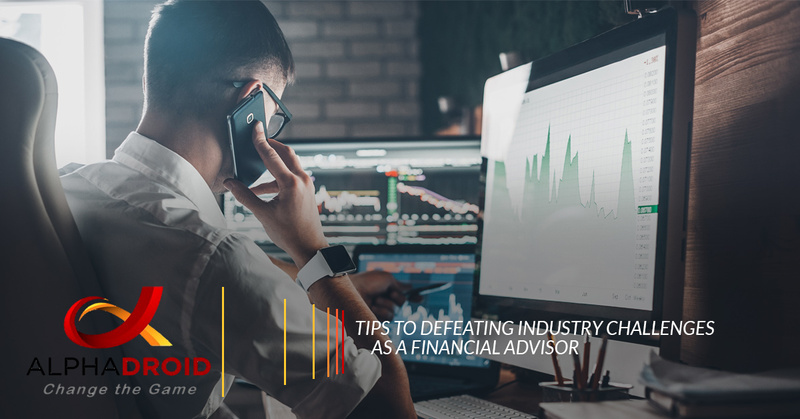 With all the challenges the industry faces, here are five tips to help financial advisors and financial firms overcome them. Being a financial advisor is no walk in the park. One of the biggest challenges advisors face is finding (and keeping) clients. To gain clients, advisors and firms have to stand out by offering something that will grab the potential client’s attention. An easy way to find new clients is networking outside of your inner circle. Advisors can also find great prospective clients by introducing themselves to those in, or near, retirement. This is a beneficial way to find clientele because there is less competition, as opposed to targeting younger, working clients. Becoming involved in your community is another great way to find clients, as it provides a natural and effective way to network with those around you. Again, a larger clientele makes financial advisors more appealing, so it’s important to quickly find prospective customers. Once you find your clients, your work is not done, in fact, it is far from complete. Firms and advisors need to keep their clients happy. Successful advisors develop personal relationships with their clients; to be effective at this, they must be able to manage your clients’ expectations and emotions. Providing consistent communication is also key to retaining your clients. Responding to calls, answering emails, and keeping the client updated are simple ways advisors can show good communication. Financial advisors who are able to make their clients understand the importance of the personal element in the industry will end up having success in the long run! Educate the Client – An advisor should teach the client about themselves and their services, and how they can help them with their financial decisions. In addition, advisors should let clients know their values and goals to help the client understand what to expect. Avoid Making Promises You Can’t Keep – Not delivering on certain promises will eventually lead clients to lose trust in their advisors. Stay Connected – Developing a strong client/advisor relationship can make an advisor’s work much easier. Clients are more likely to trust their advisors if they have a solid relationship with them. Listen to Clients – Advisors should always assure clients they understand and empathize with them before offering a solution to their financial needs. Technology has certainly changed the expectations clients have of their firm, bank, or advisor. In fact, advisors are implementing technology into their everyday activities as a strategic way to attract new and younger clients. Technology is used to compare financial advisors on the internet, and some consumers even manage their finances online. A financial advisor’s website should be updated and, more importantly, mobile friendly. If an advisor’s website is not mobile friendly, they are potentially being overlooked by prospective clients. Some advisors depend on technology to be more efficient and profitable in their work. A variety of programs are targeted to financial advisors, but few are effective. It is important for financial advisors to realize that technology is important, not only to their pitch to millennials and younger generations but to their own growth and success. At AlphaDroid Strategies, we are proud to be the allies of financial advisors, offering them effective technology for their work. Our asset allocation software is specifically designed to do the ‘hard work’ associated with financial advising, allowing advisors to focus on developing strong relationships with their clients. AlphaDroid doesn’t just keep your investments strong by pursuing great opportunities, it works equally as hard to protect your investments from experiencing lows. It is truly the pinnacle of asset allocation software. Financial advisors that center their focus on their clientele and their needs will be the same advisors whose clients are more likely to give them a referral and create or maintain a good reputation! To learn more about AlphaDroid Strategies and our effective financial management software, click here!